Can you tell that we teachers are already back in the classroom, up to our arms in text books, work books, bulletin board supplies and really long to do lists? No more early Monday morning blog posts from me. Mystery Ingredient Monday was a nice reminder that we do in fact still need to eat dinner, even if I haven't sorted out pencil cases and school supplies yet. This recipe was an awesome find on Pinterest that has found it's way into our regular rotation. I found it while looking for an easy stew that was more gravy-like than soupy. You can find the original recipe here. Don't you wish there was a feature on Pinterest where you could denote which of your pins you've actually tried? Here are some tweaks I use to make it more my own: I sub one cup of beef broth for red wine, and I follow America's Test Kitchen's advice and buy chuck roast that I cut into stew meat sized chunks...more marbling, less gristle, more yumminess for you. 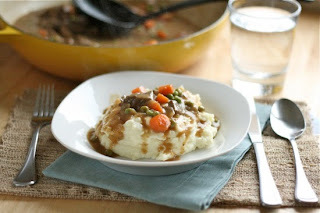 I haven't tried it yet, but the original blogger assures that this can be made in the slow cooker if you'd like the comfort food, but not the residual stove heat. Side note: don't use red wine that turns your teeth blue, it'll give a purplish cast to the stew, which will still taste great, but won't look so appetizing. Ask me how I know. The particular magic for this stew is the finish. At the very end, you mix together softened butter and flour and use that to finish the sauce. Mixing it with the butter keeps the flour from getting clumpy in the gravy, and the butter gives it a rich finish. Served over a bed of mashed potatoes, it's delicious! This is a good go-to-meal if you're bringing someone dinner. It's easily doubled, stew and mashed potatoes both reheat easily, and it isn't lasagna. Not that I'm knocking on lasagna, because that's good too. Be sure to visit Tasha, who's hosting this week's link up, and to be envious of Jessica, who's still on a real vacation. It's my turn again, and next week's mystery ingredient is Leeks! which I love, and you should too. Hope you have fun! Indeed, great minds. I too love lasagna but this would make a great sub for the "drop off" meals. More bud'a, more gravy, and more mashed...who could ask for more. Leeks, huh... I remember you and Frank making Leek soup and it was my first leek dish. Should be interesting to find another leek dish. Leeks are Lovely! I don't know if I'll get the wifi to post a recipe link up but I can declare a new ingredient next Monday. Writing that post now at the coffee shop and scheduling it. Love blogger. Anne! I made a "Pinterest in Real Life" board and repin the pins I've tried and I review them so to speak. Anyway, just an idea. And this looks delicious.